Looking for a beautiful autumnal dish? 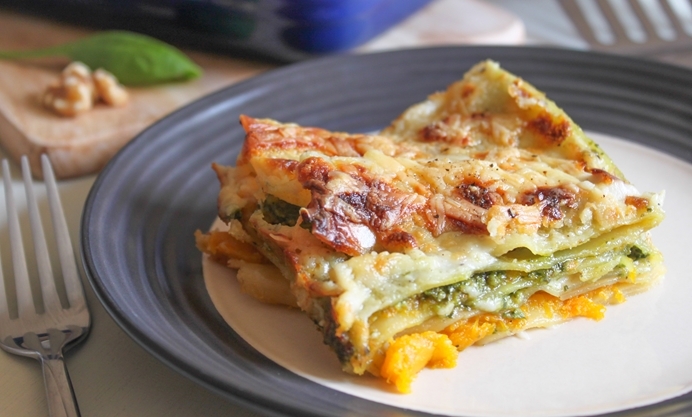 Becca shows how roasted squash can transform lasagne. Add a simple spinach and walnut pesto and a creamy béchamel sauce and you’ve got yourself the perfect dinner. If there’s one ingredient that comes to mind at this time of year, it’s the pumpkin - or its far-easier-to-deal-with relative, the butternut squash. Just one mouthful of that soft and curiously sweet vegetable immediately brings to mind images of autumn leaves and wellington boots. 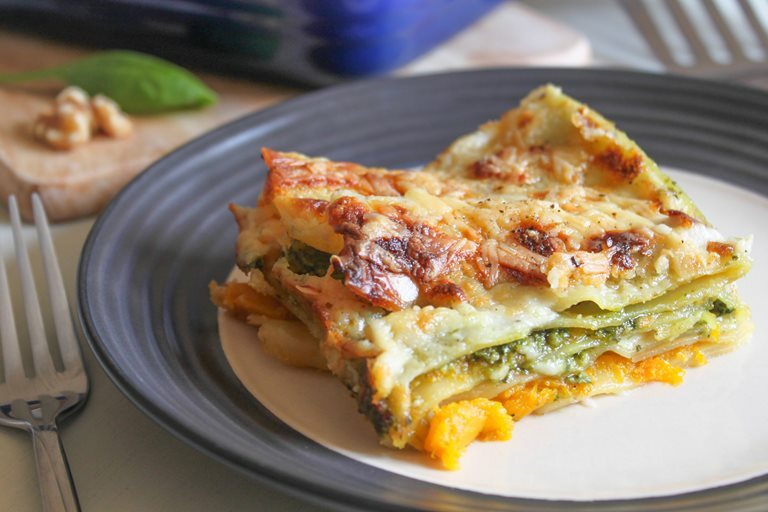 Its flavour is really brought to life when it’s roasted - and once you combine the roasted squash with a simple spinach and walnut pesto and a creamy béchamel sauce, you’ve got yourself the perfect dinner. We all know that lasagne isn’t exactly the quickest dish to make, but sometimes a couple of hours spent in the kitchen is just what I fancy, especially when the weather outside is either cold (i.e. : most of the time) or rainy (i.e. : all of the time). There’s something very therapeutic about putting some music on, closing the kitchen door and leaving all your problems behind in a big panful of béchamel sauce. 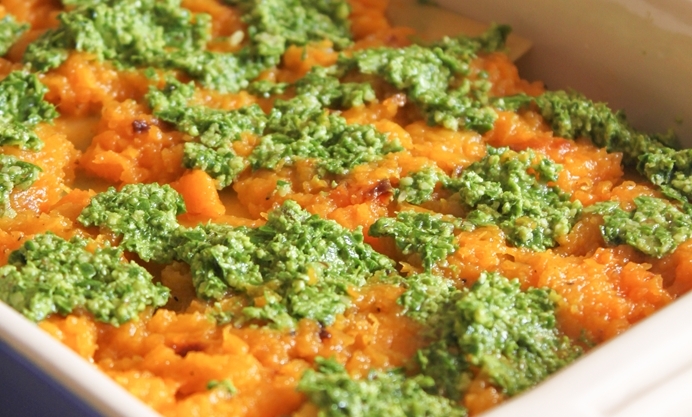 The spinach pesto in this recipe not only adds a bit of interest (look at those colours! ), but some extra nutrition too - I always feel virtuous when there’s a bit of green in my food. The combination of the slightly sweet roasted butternut squash, the nutty pesto and the cheesy sauce is just heavenly. I always use no-boil lasagne noodles (in fact most of the lasagne sheets I see in the shops are ones that require no pre-boiling), but if you’re not lucky enough to find those where you live, just remember to cook them beforehand. You’ll be able to boil them while the squash is roasting so it shouldn’t take too much longer - and anyway, what’s one extra job when you’ve already committed to cooking a lasagne? This recipe serves 4 (or 3 if you find it hard to resist going back for seconds…), so it’s perfect for a small family or dinner party. Serve it with a slice of garlic bread, a side salad and a glass of white wine and you might even be able to stretch it to 5 or 6 - but doing that would mean no seconds for anyone, so plan carefully!